Can we talk about fruit punch? And, let me be clear: I’m not talking about a punch made of fruit, logical as that would be. I mean that classic American drink flavor, ‘fruit punch’, which tastes less like any actual particular fruit and more like the general idea of fruit, sweet and a little floral and a little tart and really really RED. I haven’t actually had any in years, but I definitely grew up drinking Kool-Aid Tropical Punch, which is the canonical fruit punch in my mind. It’s not quite Proust’s madeleine, but I can still distinctly taste its sweet-tart flavor and feel it prickling at the back sides of my tongue. 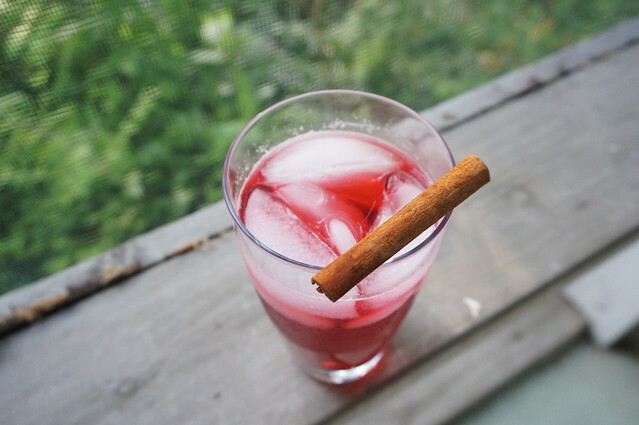 One very common agua fresca, agua de jamaica, has a similar profile to fruit punch: sweet, tart, and really red. And what’s the English word for ‘jamaica’? Hibiscus, of course. Bryant Terry’s Afro-Vegan: Farm-Fresh African, Caribbean, and Southern Flavors Remixed (which I adore) includes a recipe for a Roselle-Rooibos Drink, pulling together the roselle of the Caribbean with the rooibos of South Africa for a trans-Atlantic treat which is (you guessed it) sweet, tart, and really red. Not surprising, once you realize that roselle is just another word for hibiscus. So all signs pointed to the hibiscus flower, but I had one more problem to solve: all that sugar. Every recipe I read called for roughly the same proportions: about a cup per half-gallon. (Incidentally, the same ratio as Kool-Aid, so: consistency.) Sometime in the past couple decades my taste buds took a weird turn, and I just can’t stomach that much sweetness in drinks anymore: my tongue feels furry, and it just isn’t appetizing to me. So a succession of test batches had me teeter-tottering lower and lower, trying to bring down the sweetness without either letting the tart flowers pucker my lips or watering the whole thing down to insipidness. 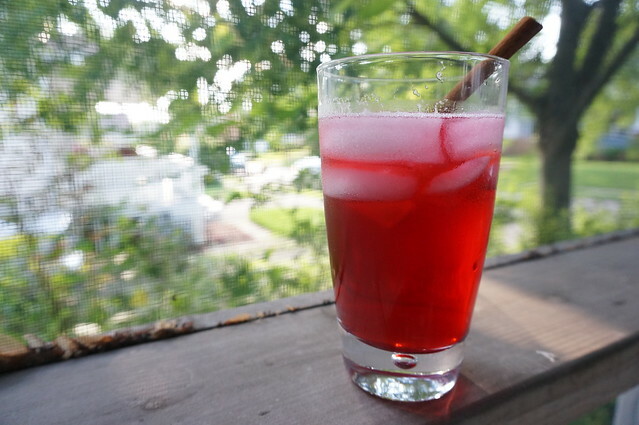 In the end, I settled on a drink that’s flavorful without being overpowering, with just enough sweetness to bring it into balance and some strong spices to punch it up a bit. (Get it, ‘punch’? Ha.) If you like a very sweet summer drink, I recommend you try one of the linked recipes in the headnotes below. But if you’re like me and want a summer chiller that doesn’t leave your tongue all furry, I think you may have found your match. 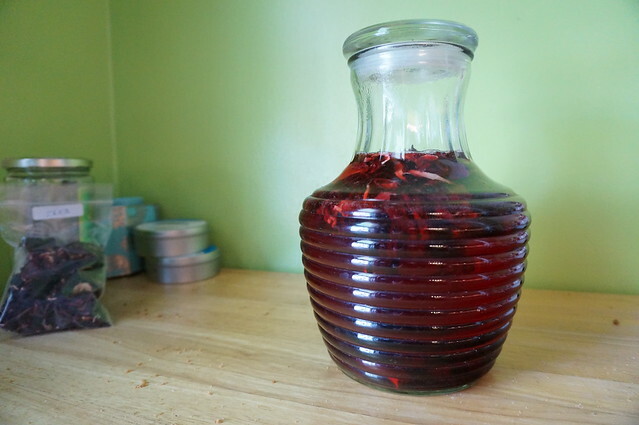 Infusions of hibiscus flowers are common throughout Latin American and West Africa, as well as many parts of Asia. They’re not as common in the United States, which is a bit of a shame: they make a delicious drink that’s quick and refreshing (and have a good dose of vitamin C and anthocyanins, if that’s something you’re interested in). My version differs from the mainstream a good bit in being surprisingly unsweet, simply because that’s how I like it. If you’re used to very sweet summer drinks, give this one a try for a change and see how you like it. And if you’re a fellow dry-drink lover: welcome, pull up a chair, and have some of this barely sweet fruit punch. Not sure where to find hibiscus flowers? Check health food stores and Latin markets, where you may see them listed as Flor de Jamaica. Or of course, there’s always our friend the Internet. 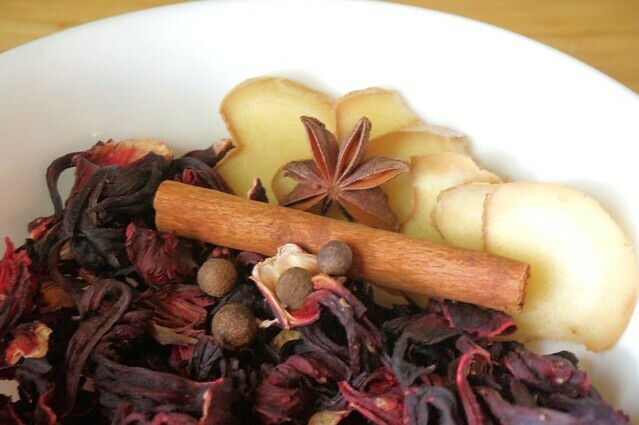 Combine the hibiscus flowers, spices, ginger, and honey in a heatproof vessel. Pour in the boiling water and stir to combine. Let steep 10 minutes. Strain out the solids, and add the ice water. With the lower amount of honey, this is just barely sweet, and I like it that way. But if you find it too tart (or if you already know that you like sweet drinks), aim for the higher amount, or beyond. If you’re trying to add honey to the already-chilled mixture, you’ll probably find it most successful to combine the additional honey with a small amount of the punch in a small jar, and shake the heck out of it. Then add the sweetened mixture back to the pitcher. With a soda siphon: If you have a soda siphon that allows you to fizz up non-water liquids — not, notably, a SodaStream — you can carbonate the chilled beverage directly. With plain sparkling water: Instead of adding the 4 c of ice water, allow the strained concentrate to cool to room temperature, then combine 1 part concentrate with 1 part sparkling water over ice. I’m not drinking a lot of alcohol right now, so I haven’t tried this, but screams out for rum, if that’s your style. A white or a gold rum, I think — a dark rum would overwhelm it. Cachaça would be very tasty, too. If you happen to be in the Southern Hemisphere right now, or if you have a bit of a scratchy throat, you may be interested to try this hot: it’s equally lovely.